Product prices and availability are accurate as of 2019-04-10 21:04:26 EDT and are subject to change. Any price and availability information displayed on http://www.amazon.com/ at the time of purchase will apply to the purchase of this product. 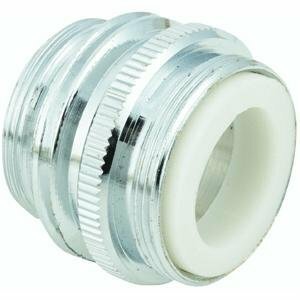 Converts standard faucet spout with 15/16", outside threads or 55/64", inside threads to 3/4", male hose threads. The product comes with washers has it has chrome color.